With the spectacular backdrops of Tenerife all around, the Gran Oasis Resort is the perfect place to enjoy paradise. 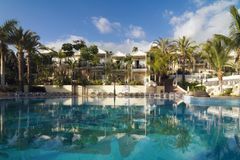 Ideally situated in the heart of the popular tourist resort of Playa de las Americas, Gran Oasis provides friendly and reliable hospitality for groups of golfers, with an all-inclusive option available that provides even more luxury. With such an awesome location on the south coast of Tenerife, Gran Oasis Resort gives you great access to most of the island’s golf courses, including; Golf Costa Adeje, Golf Del Sur and Golf Las Americas. The 4* hotel at Gran Oasis has a cool, modern vibe, with spacious rooms and a host of facilities on-site, including three swimming pools and a piano bar. This 4* hotel offers a relaxed and welcoming atmosphere, it's modern and spacious with over 400 rooms. Almost all the guest rooms benefit from sea views, while notable features and amenities include satellite television, wifi, safe deposit box, refrigerator and air-conditioning. The easy access to the resort town and all its attractions, in addition to the golf courses in the Southern region, make basing your golf holiday in Playa de las Américas an outstanding choice. The complex has three swimming pools, a gym, steam room, sauna, table tennis, volleyball and tennis courts, and a football pitch. For water sports enthusiasts, the beach is just 5 mins in a taxi. The hotel has its own buffet style restaurant for breakfast, lunch and dinner, while the snack bar is open from midday. The All Inclusive option is available year round and provides an extensive menu of drinks and food on offer. For some evening entertainment, the hotel has a pool bar, piano bar and club. Cannot rate highly enough Hotel Gran Oasis. Spacious appartments, 2 floors, twin balconies. Hotel was kept very clean with everything you’d imagine from an all inlcusive resort. Very friendly staff.